The search for good practices and examples of youth information and counselling is constant. Throughout the years, there have been many good examples, but what are they and where can we find more information about them? 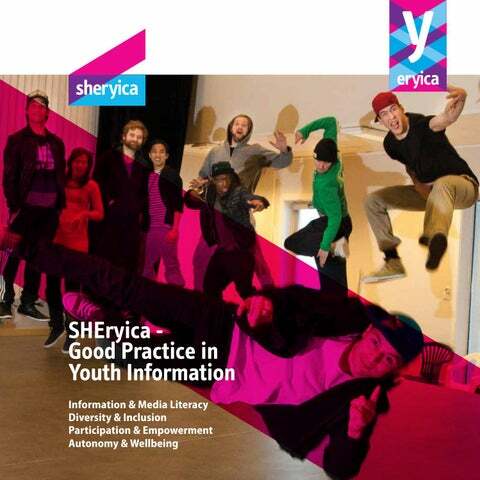 ERYICA’s Good Practice Booklet is a great tool for browsing through examples of youth information projects and good practices on different themes around Europe. This is the 4th edition of the publication. The themes are: information and media literacy, diversity and inclusion, participation and empowerment and autonomy and well-being. All of these themes play a central role in youth information, and were also addressed in the position paper “Engage. Inform. Empower. Recommendation from the main European Youth Information and Mobility networks on the new EU Youth Strategy (2016)”, written jointly by ERYICA, EYCA and Eurodesk. Information is a tool for eradicating inequality, creating understanding and building bridges. This is why youth information, with its different kinds of tools, methods and channels, is crucial. And this is why it is important for youth information workers to know about good practices and how to adapt them to different purposes and target groups. And remember: young people should have a role in this. Get interested, get excited and adapt the good practices of this publication. They have already been tried and tested. In my position as the president of ERYICA, I have the pleasure to see and experience the many different and innovative methods that are being used within our members’ services. Thank you all, it is an honour to learn from you! The promotion of information and media literacy should be at the centre of our work and one of the main goals of youth information. Without these skills, young people do not know how to be critical about the information targeted at them. These skills are needed now more than ever because prejudice and hate speech are taking over. Our role in this task is essential! Through information, we also strengthen the inclusion, empowerment, autonomy and well-being of young people. The methods and models created in youth information services can reach young people in interesting and attractive ways, for example by e-participation and social media tools. terms of the role of information and employability that will help improve the job prospects for young people, and it is important to ensure that we are sharing best practice insights. Whilst as a sector, we recognise that the Internet and digital technologies represent incredible potential and opportunities to young people, we are also very aware of the risks and challenges that are attached to our digital world. While our young people are supported and protected by a clear set of rights in the analogue world (UNCRC), their rights in the digital space are not yet defined and fully realised by all. As a network, we must collaborate to ensure that young people are informed and knowledgeable about their digital rights and feel confident to exercise them, both in a personal and professional capacity. Again, lots of great work, such as the Young Scot 5Rights Youth Commission in Scotland, is ongoing in this area. Young people are at the heart of everything we do and it is imperative that they remain so. Adopting principles of co-design is therefore essential to ensuring the effectiveness of our youth information service provision. Co-design is essentially about putting the consequence of a proposition in the hands of young people and committing to the process fully. It’s about the positive disruption of a service, informed participation and fostering innovation. It’s about giving young people confidence. We know from the young people that we work with that allowing them to explore & experiment and come up with solutions for longer-term systemic change in hugely empowering and results in more meaningful engagement. Of course, you don’t have to take action on all suggestions, but the principals of taking action together rather than ‘on their behalf’ is meaningful and empowering. The key part here is the taking action together – young people know that their participation makes a difference and results in a youth information service that is relevant to their needs. intended to act as a by-product when discussing the worries and concerns of children and young people. The worry is told to these dolls in the evening, then it is placed under a pillow, and during the night, the doll worries on behalf of the young person. Alongside activities, there have been discussions about the divorce of parents, bullying, family disputes and the pain of leaving when moving abroad. Achievements: The project has impacted more than 4,000 young peoples’ lives so far. This demonstrates that youth information work is needed and the topics that are covered by the service affect many young people. The outreach YI worker has also created workshops that will be used in schools and in local youth houses when the project has ended. The topics covered are the following: bullying, international opportunities, summer work and gaming, amongst many others. Our YI worker has offered training sessions and meetings for those who work in rural areas to share ideas for working together. This has also been an opportunity to share thoughts in a professional way. Since the beginning of the project, our YI worker has used social media as a tool to interact with young people, using most frequently the applications WhatsApp, Instagram and Snapchat. These apps are very diverse, and are a great means to interact with our YI worker and receive help with questions and problems. From 14-16 October 2016, the youth conference Webdays 2016 took place in Berlin. “Your Data, your security, your opinion” – this motto describes what the conference was all about: young people discussed data security and consumer protection on the Internet. In order to hear what young people have to say about digital issues, they debated in workshops with experts. Achievements: Three days after the videos were released, over 150 young people applied for the conference. The videos generated more than 250,000 views and more than 2,000 comments from young people. Here you could see their main interests and what was most important for them. For example: “The Internet has brought some huge changes over the past years. Everything seems easy: meeting people with dating apps, expressing your political opinion or sharing pictures with your friends. But it’s not all good. People tend to be superficial selfpromoters and the personal communication suffers. We need to talk!” (Simon, 19 years) Nowadays YouTube is more than beauty advice or gaming. Successful bloggers on YouTube reach out to millions of young people. It is a “place” where opinions and different views, even on political issues, are exchanged and discussed, and where youth information on serious topics can be disseminated and reach young people. This is the second time IJAB chose this way of successfully addressing young people and encouraging them to discuss digital and political issues. 60 participants between the ages of 16 and 22 visited the Webdays conference in Berlin and discussed with other youngsters, politicians and experts about all the topics related to Internet and data security. All claims and questions were collected and given to the Ministry of Justice and Consumer Protection. A small delegation of young people was chosen to represent the results of the conference at the IT-Summit of the German Federal Government in November 2016. In 2015, the Portuguese National Youth Council (CNJ) launched the STOP short film contest. The initiative, sponsored by Escolhas Programme and Movijovem, was part of the Council of Europe’s No Hate Speech Movement, which CNJ embraced from the very beginning. One of the ambitions of CNJ is to help build a society that is fairer and more equal. This ambition led CNJ to launch the STOP campaign, which was intended to raise awareness about inequalities regarding young peoples’ access to their civil, political, economic, social and cultural rights. After the deadline, a selected number of short films (one for each theme) were presented at an event – “Dialogues on short films” – and served as a starting point for debates between experts, contestants and young people. At the end of the event, the winner was announced and awarded a 250-euro voucher, and a 2-night stay at one of Movijovem Youth Hostels. The event “Dialogues on short films” took place on 2 December 2015 at the National Sport Museum in Lisbon. Video/Film as a tool to engage young people in social matters and a way to raise awareness and promote dialogue on different subjects. Contributed to raising awareness among young people regarding different forms of discrimination (specifically the themes listed above) and how they constrain peoples’ access to their rights; Provided a space for young people from different backgrounds to share creatively their perspectives regarding different forms of discrimination; Allowed young people to develop social, personal and communication skills by being actively involved in creating, directing and editing a social-oriented film; and Promoted dialogue between young people, decision-makers, public institutions and civil society organisations on how to tackle hate speech at different levels and in different fields. You(th) Challenging Diversity: Representation of Minorities in the New Media Description: The project You(th) Challenging Diversity: Representation of Minorities in the New Media aimed to attract young people aged between 18 – 35 to discuss and analyse how to provide all citizens with open access to new media, as well as how to build multicultural practices in the media by presenting good examples of cooperation and living together. The project focused on research on new media and minorities (from June-July 2015), and 4 events that took place in each of the participating countries (Croatia, Greece, Bulgaria and Macedonia). Each event lasted 2 days and provided different perspectives (on open access to new media, stereotyping, and multicultural practices online) mirrored through presentations, panel discussions and workshops with experts, media professionals, local representatives and participants. The final event, summarising the previous events, took place in Skopje, Macedonia, in the form of a Final Youth Forum. The outcomes of the project were online media research, as well as recommendations for the media and other stakeholders on how to report on national minorities and promote diversity in their home countries. The general objectives of the Europe for Citizens Programme targeted by the project were to foster European citizenship and improve conditions for civic and democratic participation at EU level, specifically by developing citizens’ understanding of EU policy-making processes and promoting opportunities for societal and intercultural engagement and volunteering at EU level. The project specific aims were to: •	Raise awareness about the representation of national minorities in new media; •	Boost the quality of media reporting; •	Stimulate exchange between journalists, NGO activists and media workers on European level, as well as strengthen cross-border cooperation through regional cooperation mechanisms; •	Promote intercultural learning, preserve diversity through minority rights’ protection and empower European youth on active citizenship and participation in society; and •	Enhance the visibility of Europe for Citizens. Achievements: 4 forum events, fruitful debates and 4 panel discussions at the final forum, which included young researchers, youth media makers and youth activists. represented in the new media. The report is based on findings from the monitoring project that analysed the underlying features of 15 news stories covering minority issues from the most prominent news websites in four Balkan countries: Bulgaria, Croatia, Greece and Macedonia. Last but not least, 10 recommendations for good practices and multicultural reporting were concluded and produced at the final event of the Youth Challenge Diversity project. The recommendations were presented at the Youth Forum in Skopje at the end of the event. The 10 recommendations are available for download. Youth Information tool: Project website (challenging-diversity.eu), Mladiinfo website (www.mladiinfo.eu), social media channels, peer-to-peer promotion. Europe is becoming more and more diverse. This is not a new phenomenon; it has been going on for generations. But where does ‘diversity’ begin and end? In a way, from the moment that you enter an elevator with two people, there is diversity in that elevator… Which is why we increasingly use the term ‘super-diversity’, meaning ‘diversity IN diversity’. Every person is unique and we as youth workers must be aware of that, always. Try to involve as many different people in your existing formats.This is the classic way to deal with diversity and inclusion. The goal is inclusion. This way has had different results, not always positive ones, but sometimes really positive ones … So the main lesson is to keep on trying … It’s too easy to say: ‘we don’t reach THEM’. Every self-respecting youth information/ youth counselling organisation should keep making the effort to try inventive, creative new things regarding this issue. Bring youth information and counselling to different target groups. Reach them where they are. Make bridges. It shouldn’t always be your goal to include THEM; sometimes it’s already enough to meet THEM! And by meeting them, you will reach them. Following good examples, try to face these challenges, let them (and this introduction!) inspire you to be inventive and creative! POMP – Support to Young Immigrants and Families Description: The programme is aimed at the social, cultural, economic and political integration of immigrant families who have immigrated to Slovenia in the last three years. The objective of the programme is to improve the quality of family life, as well as the communication of all necessary information, support and advice that can be offered on an individual basis, such as: solving problems in the family, family communication, understanding and assertion of social rights, opportunities and methods of education, exercising rights to health care, access to work and employment, and housing policy. The aim is to integrate individuals into society, and it is therefore necessary to ensure effective access to social, cultural, economic and political rights. Through the programme, we are establishing mutual respect within the family, encouraging tolerance and solidarity as well as understanding of social and cultural environments. We are striving to reduce inequality and polarization in society, and use information to empower immigrants. Achievements: By using information and specific workshops and working methods, the individuals consolidate and master the Slovenian language, acquiring intercultural competences along the way. Young people receive support in their integration into Slovenian society and its environment (social participation). Consequently, they perform better in school and acquire learning habits, hence increasing employment opportunities and better living standards. The youth information centre offers professional help in solving problems in the family and the environment, psychosocial support (counselling) and information about the rights and obligations of immigrants. They learn social skills, improve communication, computer literacy and are thus integrated into a broader social network. An interesting debate with local young people and experts who introduce a controversial subject from different points of view – to open the minds of young people – in collaboration with the Youth Council of the German Speaking Community of Belgium, other expert organisations and the Youth Information Centre. Experts are invited to come to an open debate about a certain topic. They usually give a short presentation that leads on to a debate between youngsters, stakeholders, and other interested parties. The Lounges are open for everyone to join- anyone who is interested in a certain topic/subject and is available to join the lounge. The lounge is dynamic and creative, subjects and experts are chosen together by the working group of the youth council (the youth information centres are part of this council). So far, the following topics have been discussed in the lounges: •	After Work Lounge: What it a youth council? How can I participate? •	Brunch Lounge: rural development project: 100 villages – 1 future •	Future of religious education in our schools: Yes or No? •	Strikes and labour unions •	Blood donation lounge Ideas for future lounges are: refugees, TTIP, visions for a future EU, my own work-life balance.... It is also intended to give each event a friendly and relaxed feel, which is why it usually takes place in a nice working environment like a café or a youth club, with some homemade food and drinks – sometimes also linked to a seasonal theme like Oktoberfest or Halloween. Achievements: The lounges give young people an insight into a current topic, allow them to express their opinion on it and to enter into a debate with experts, who themselves might learn something from the point of view of the young citizens. All participants are expected to leave the lounge with an open mind, new insights and maybe new ideas for future projects they might feel motivated to launch because of the lounge. GO Finland – Digital game familiarises young people with Finnishness Description: GO Finland is a digital game on JIBBO’s website. The game is directed at young immigrants and asylum seekers. Its goal is to familiarise them with Finnishness. The project is funded by a grant from the Ministry of Education and started in March 2016. This project continues with active marketing. We hope that it will reach its target group and grows into a very good practice of youth information. Over the past year, many asylum seekers have come to the region of Seinäjoki, and there are also lots of foreign students living here. Like every culture, Finnish culture is different and there are lots of new things to learn. We wanted to think of inspiring ways to teach conventions of Finnish culture to these youngsters and help them to adjust to their new environment. Digital youth information was the theme in 2016 and we had never tried a digital game before, so it was an easy decision. Our project started by searching for a suitable game developer, and ideally we wanted to employ a young person for the role. In this we succeeded, and the development of the game took three months during the summer, so was an ideal summer job. At the same time, we gathered ideas for the game content, with the help of a specialised youth worker and her clients. We asked these young people, who are already accustomed to life in Finland, about different aspects of life in Finland. The contents of GO Finland (questions and answers) were created based on these answers. The game language of GO Finland is English, therefore as many youngsters as possible can play it. There are five different scenes in the game: people, manners, services, school and nature. In every scene, there are 4 to 6 different objects to find and different questions to answer. After answering, the player gets feedback or the right answer. The player can play all scenes through at one time or pick the most interesting ones. Developing Detached Youth Work Practice, an Erasmus + funded project, in which Aġenzija Żgħażagħ was the lead partner in association with the Centre for Sustainable Community Development (CSCD), Romania, YMCA George Williams College in the UK and Stichting Jong Rotterdam (Foundation Youth Rotterdam). The project aimed to develop and strengthen detached youth work services in the partner countries through the exchange of good practice and peer learning. Detached youth work aims to make contact and be available to young people where they gather and congregate - in the street, park, locality - with a view to supporting them in gaining knowledge, recognising new opportunities and engaging positively with the world around them. All the partner organisation involved in the project were committed to the concept of detached youth work and the benefits that could accrue to young people, youth organisations and society in general if it were practically and effectively implemented “on the ground”. Detached youth work was new territory for both Aġenzija Żgħażagħ and the Centre for Sustainable Community Development (CSCD), Romani, but YMCA George Williams College and Stichting Jorg Rotterdam had relevant experience in the field. This combination of experience and in-experience proved both fruitful and challenging and the outcomes of the project will not only the partner organisations and the young people with whom they work, but also help promote detached youth work practice as a valuable and important, if demanding, aspect of youth work. The project also reflected the ambitions and aspirations of the partner organisations. In the case of Aġenzija Żgħażagħ, which initiated and coordianted the project, it served to expand and strengthen the services it provides for young people in Malta while also fulfilling a commitment in the national youth policy strengthen Towards 2020 - A shared vision for the future of young people - to provide “outreach and detached youth work services to address, in particular, the needs of socially excluded and at risk young people”. A report on the project and its outcomes was published in summer 2016 and can be provided upon request. Achievements: In 2015, Aġenzija Żgħażagħ conducted a pilot project in detached youth work in Kottonera, Valletta and the South East region in Malta with a view to providing a detached youth work service for young people in these areas commencing in 2016. Action: As a third dimension, the active use of different tools, methods and communication techniques must be supported. Young people need to have a positive experience with different forms of participation processes to initiate their own activities according to their positions and interests. What is more, they need to identify realistic opportunities for successful participation, using their everyday communication tools and engagement for political participation. To conclude, youth information needs to empower young people through information about concrete possibilities of participation. Through counselling, youth information work can help young people to frame their opinions, form their own judgment and allow them to take part in current discussions as active citizens. In this sense, it is important that youth information workers strengthen their position as partners for political stakeholders. We must also take an active role as a connector and translator in the field of youth participation in two ways: with and for the young people and in close connection to decision-makers at local, regional, national and/or European level. Youth information workers must take a decisive and self-confident stand as a political player to advocate for young people. To inspire and further develop youth information as a catalyst for the democratic participation of young people, the following examples of good practices represent a source of inspiration for all of us. 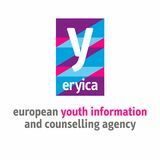 The variety of methods, innovative approaches and dynamic practices gives support in further developing, promoting and fostering participation and empowerment of young people not just for ERYICA’s members - but for youth work in general. The guide can be read following the proposed order or randomly. Every reading card addresses several initial situations, which may respond to the reality of being a youth professional. The main objectives are: •	To produce a tool for youth professionals, including resources for youth promotion; and •	To promote knowledge and experiences through the guide, to be open, dynamic and flexible. Achievements: The guide is open to everyone through the platform textbooks, the guide is a collaborative project and community effort; anyone can add or modify content, thus it is an open, lively and dynamic tool. The guide has been promoted by the administration, but was designed collectively by different professionals working with young people. This collaborative process has a core group, composed of experts from around the country. Throughout 2015, several meetings were held in order to validate the design of the guide, make monitoring and participation workshops, design the script and content, and validate its development and content. The methodology used in the process of opening consisted of three workshops, with 30 participants. Since its launch date, there have been a total of 400 entries, with an average of 37 posts a day and about 4 visits to each chapter. Aġenzija Żgħażagħ moved into its new premises at Umberto Calosso in February 2015. The new premises enables Aġenzija Żgħażagħ to house most of its staff and services on the one site, including Youth.inc and the Youth Information One Stop Shop (YIOSS). The new site also houses the Youth Village, which provides space, facilities and supports for young people and youth organisations to organise events and initiatives. The overarching aim and purpose of the Youth Village is be to create a physical, administrative, and learning environment and culture that will attract both young people and those who work with and for them. Youth Information tool: Youth.inc and the Youth Information One Stop Shop (YIOSS). Achievements: The Youth Village aims to: •	Streamline administrative services and optimise use of physical infrastructure and supports; •	Provide a safe and friendly environment for young people where they can access a comprehensive range of support services; •	Foster a cross-sectoral approach and professional collegiality in addressing young people’s needs and aspirations; •	Serve as a focal point for young people and youth workers and for services provided by other Ministries and entities; •	Ensure value for money; •	Focus on the needs of ‘at risk’ young people: early school leavers, young people not in employment, education or training (NEET), young people with literacy problems, young migrants etc; •	Serve as an ‘incubator unit’ for developing new and innovative services and supports for young people; •	Provide Aġenzija Żgħażagħ with additional space and resources to expand its existing services and planned services such as outreach and detached youth work; •	Serve as a resource centre for youth workers and for the provision of ongoing professional development for those who work with young people; and •	Host the Youth.inc programme. The Youth Village was formally opened on 12 December 2015 by Evarist Bartolo, Minister for Education and Employment and Parliamentary Secretary for Research, Innovation, Youth and Sport, Mr. Chris Agius.As part of the opening celebrations, a Christmas Market that provided young entrepreneurs with the opportunity to display and sell their products in a festive atmosphere was hosted in the Youth Village. Participation Café Description: Participation cafés started in Estonia back in 2008. Throughout the years, the café has grown into the biggest event of its kind in the country. Each year around 1,500 young people and 200 decision-makers take part in 15 regional cafés, discussing different topics particularly relevant to youth. Each year five to six topics are discussed, depending on the participants’ interests. This year topics varied from the future of the European Union to mental health. The platform provides an excellent chance for young people to participate in decision-making processes and to build bridges between young people and decision-makers. Youth participation is essential for the project since young people are involved in all aspects of the organisation, from the choice of topics to the general organisation of the event. The outcome of the discussions are drafted and afterwards used for policy input and action plans. The platform is also used for developing youth participation in general. All the regional events are organised by young people from local and regional youth councils, offering them the chance to improve their management and teamwork skills. Achievements: The input from the regional cafés is used for policy input for the Estonian National Youth Council and for the action plans of the regional and local youth councils. Through the platform, around 1,500 young people have a chance to take part in direct democracy processes and to express their opinion to decision-makers. In addition, the participation cafés provide the platform and experience for young people to start actively participating at all levels. Intergenerational Youth Convention Description: The Intergenerational Youth Convention is a pilot initiative that brings together young people at the end of their obligatory schooling with experienced professionals from a multitude of economic areas, to discuss together young peoples’ sources of anxiety regarding the labour market. This exchange allows the youth to dissipate their fears and to become familiar with relevant tactics to overcome the difficulties they may encounter on the local labour market at the beginning of their professional careers. At the Intergenerational Youth Convention, both groups of participants also exchange their feelings about the existing educational system and the employment possibilities for young people and come up with recommendations for improvement. These recommendations, which aim to help young people make a better choice for their future career and acquire the necessary competences recognised by the local labour market, are presented at the end of the Intergenerational Youth Convention directly to members of Parliament. The National Youth Information Centre organised the Intergenerational Youth Convention in collaboration with two partner organisations (Conférence générale de la jeunesse du Luxembourg - CGJL and Center fir Altersfroen - RBS) within the framework of a project entitled Information, Citizenship, Employment – Trampoline (Information Citoyenneté, Emploi – Tremplin), co-funded by the European Social Fund. Empowering youth with regard to the labour market; Building a first professional network; Developing recommendations to improve the existing educational system and make the labour market even more youth friendly; and Expressing recommendations directly to members of Parliament and the Minister of Labour and Employment. Empowerment through Project-Based Participation “The Project Cradle” Description: To implement autonomous projects and collaborative initiatives at a young age develops skills, an entrepreneurial mentality and confidence. The method ‘Project-Based Participation’ gives young people the opportunity to influence their communities and their own lives by realising their own ideas and thus actively contributing to the development of society. Method The method is action-oriented (learning through action), and helps to strengthen the independence, self-confidence and learning ability of each young person. The method puts youth participation in focus. Project Cradle The Project Cradle is a key tool that the youth information centre uses in Project-Based Participation. Key concepts here are youth participation and a focus on the young person’s own ideas and initiative. The reason why this method works is that it is based on young people’s own energy and interest, and that it challenges young people in taking responsibility for implementation and result. Young people from 15 to 25 can get help through The Project Cradle in many ways: •	Guidance/mentoring; •	Workshops; •	Funding; •	Infrastructure - Access to equipment, rooms, working facilities, other infrastructure; and •	Networks. It is our experience that project-based participation is universal and works regardless of social or geographical background if you focus on what the young people are passionate about. The method has values in terms of self-development, youth initiatives, community development, entrepreneurship and democracy. Increased awareness among young people about the local environment and resources; Positive attitude towards youth in the local community – the city now sees young people as a resource; In regards to depopulation of young people in rural areas: - If young people have had the opportunity to influence their own communities, they have a greater desire to come back to their home region to settle down with their family after graduation; and If young people are taken seriously and are allowed to have an impact on their community they are less likely to feel alienated. Failure to develop quality services for young people will lead to their energy and frustration finding outlets elsewhere. Youth Information tool: Counselling, workshops, networking, social media, online services, peer-to-peer, international projects. The topics of the 8 workshops correspond to the 8 fields of action that this new cross-sectoral youth policy will cover. The Youth Board of Cyprus also organised the second Youth Conference, which was held at the European University of Cyprus in Nicosia on 16 November 2016, and which brought together young people from all over the country to express and discuss ideas for a better Cyprus. Achievements: The outcomes of the 8 workshops were summed up and written down as recommendations in an official report which was submitted to the Minister of Education and Culture, Dr. Costas Kadis, who is the responsible Minister for youth issues. These recommendations are now being considered by the Youth Board of Cyprus, which is in the process of composing a new youth strategy. Youth Against Corruption Description: ‘Youth against corruption’ fostered activism among high school students in all the cities involved. It helped identify youthfriendly ideas for acknowledging and fighting corruption in the country. Before the training, the students completed a survey on corruption and the reasons why levels of corruption are so high in Albania. By doing so, they expressed their opinions on this matter, as well as their willingness to participate actively in schools and local communities. These youngsters were trained and informed about anti-corruption in order to increase their understanding of good governance and citizen participation through activism. They participated actively on anti-corruption practices through workshops, forums and social media groups. The Facebook group ‘Të rinjtë kundër korrupsionit’ helped students from all cities share ideas and inspiration, as well as get in touch abort the activities they had organised in their respective towns. High school students have undertaken joint initiatives in designing information leaflets and meaningful posters in an awareness-raising campaign. It resulted in an increased number of trained youngsters in 5 main cities in Albania (Tirana, Korca, Shkodra, Peshkopia, Vlora). Their participation in advocating was of great importance at local level. It spread the understanding of the core causes of corruption in Albania and contributed to the creation of an open youth society. The trained high school students denounced cases of corruption they had encountered in their own schools and in other institutions. They mentioned corruption cases encountered commonly in public hospitals and courts. Encouraged young people to actively initiate or join community initiatives; and Contributed towards the creation of a transparent and open society, where young people may denounce without fear and prejudice every single act of corruption performed by an individual, group or political party, as well as actions that help or stimulate corruption. Students also had the possibility to check the latest updates on the project on the website (anticorruption.youthact.al) and see their peers’ engagement in the other cities, inspiring them to fight against this cause. They also received other general information regarding corruption, videos explaining it and the impact it has, examples of corruption in other countries, etc. The youngsters were eager to do something and influence positive change in society. During the training sessions and meetings, students stated that this phenomenon had become a cultural issue in Albania; they used case studies and items from news and investigative TV programmes to examine how corruption can affect effective governance at all levels and have given their personal solutions as to how this can be solved. EureProjekte Description: Young people are bursting with ideas. In order to utilise and support this inspiration, the initiative EureProjekte (YourProjects) was brought into being. EureProjekte is an initiative of the Federal Ministry of Families and Youth and is carried out by the National Network of Austrian Youth Information Centres. Young people aged 14 to 24 with an interest in Austria can apply for a grant of up to 500 Euros. In addition to this initial funding, they also receive an individual project consultation with employees of the youth information centres in the Federal States. Funding is granted to projects or project ideas that meet the basic eligibility criteria in form and content and have been chosen by a jury in a selection process. Project ideas must be creative and innovative, open up new spaces that contribute to social diversity and promote cooperation. There are no limits to the topics: arts and culture, environment, health, sustainability, social involvement, society, technology, sport, etc.! Achievements: By December 2016, more than 200 projects have been supported. Collectively, the funded projects have reached more than 9,000 (young) people across Austria. A fundamental challenge for all young people is to find the information and learn to use information required to confidently and successfully manage their own lives, develop their independence and make positive healthy choices to support their wellbeing. Youth information, has an important role in this supporting autonomy and well-being. Firstly, because it provides quality information about all aspects of young peopleâ&#x20AC;&#x2122;s wellbeing including their mental, physical and sexual health. As well, youth information provides resources and skills that will lead young people to develop their ability to both decide for themselves how they want to live, and to secure the resources required to live independently. While other forms of youth work can easily claim to likewise support young people in these goals, youth information provides an important role for at least one reason. Consider that for most young people, their engagement with autonomy and well-being is an evolving process in which young people begin by addressing smaller, easier challenges, in terms of their health and personal independence and then progress to more complex, difficult challenges that lead to major transitions and steps in their lives. Youth information workers have a particular expertise, unique to their profession of translating information and presenting it at the level that young people need it at the time when they need it. In this way youth information enables young people to address small challenges, when it is time for small challenges, and significant challenges when it is time for these. It provides exactly the information that is appropriate to the individual and circumstances. processes, or transitions in their lives, that of taking on of autonomous decision making. Youth information supports young people in this process in that youth information workers support young people to make informed decisions. They help young people to identify, gather, sort and allocate value and meaning to information. They help young people to identify the options in terms of the information they have gathered and they help young people to identify and understand the consequences for each option. Youth information workers do all of this in a manner that is non-judgmental and with positive regard for the young people they work with. In this way, young people are able to move towards autonomous decision-making is a supported manner. Many young people may not have occasion to make major life decisions with youth information workers. That doesnâ&#x20AC;&#x2122;t mean that youth information canâ&#x20AC;&#x2122;t offer the opportunity to develop experience and skills in decision-making process. Youth information, through its projects and activities provides young people with a safe environment to practice decision-making activities. Through the same processes, youth information workers engage young people in considering information, options and work with them to discuss and consider consequences for decisions. In this way, youth information can be seen as having a crucial role in supporting the wellbeing and autonomy of all young people. Info zone on radio is the name of a radio show produced entirely by employees and volunteers of Info zone (youth organisation) engaged in the youth information and counselling programme. Info zone on radio was broadcast for more than 8 years on the public radio station “Radio Split”, as a one-hour show and was the result of continuous cooperation between professionals (main editor, technicians and journalists from mainstream media) and youth information workers. Since October 2016, Info zone on radio has been part of the local community radio station “Sunce” (every Tuesday, 30 minutes). Info zone has been active in the field of youth information since 2008. Apart from providing face-to-face youth information and organising public events (inside and outside of the YIC space), Info zone uses different media tools to spread quality youth information and promote youth activism and participation (web portal, YouTube channel with audio and video materials, Facebook page, printed magazine, radio show). The radio show in particular enables us to talk about topics which are not often discussed by the mainstream media, to inform both young people and other citizens about youth issues, to promote different programmes and opportunities by and for youth, and to monitor stakeholder activities in the field of youth empowerment. The radio show also has an important role in networking activities. Don´t risk it! – A peer-to-peer youth information project about sexual health and reproduction Description: Don’t risk it! is a peer-to-peer youth information project about sexual health and reproduction issues, promoted and funded by the regional Ministry of Equality and Social Policy of Andalusia (Spain). This action is in partnership with the Red Cross in Andalusia. Due to the increasing number of young people who suffer from sexually transmitted infections (STIs), a number which has now returned to levels seen in the 90s, the Andalusian Youth Institute (IAJ) decided to promote a new campaign, the main objective of which is to provide information about the different means of avoiding STIs. In other words: inform to prevent. To achieve this goal, the IAJ collaborated with the Red Cross Youth, which is present all over Andalusia. This allowed sending information to a maximum number of young people. Furthermore, young people in Andalusia are being provided with information on this topic in places where they get together, such as concerts, festivals, universities, etc. What are we doing? During the campaign, Red Cross Youth developed, in each of the municipalities identified, at least one STI awareness action, consisting of: The deployment of resources and campaign activities in areas with a high concentration of youth leisure activities and at the busiest times to target a maximum number of young people. Each intervention lasts a minimum of 2 hours and may extend up to 3 hours if there is significant interest among the target group. The primary way to get information is through different offices. However, the Andalusian Youth Institute is also responding to requests through social media (Twitter, Facebook, etc.) and e-mail. Installing tents, stands or similar equipment in the chosen area. This space is used as an information point and the intervention is coordinated from there. This action, which is still being developed, but it has reached so far over 16,000 direct and indirect participants throughout the eight provinces in Andalusia. The team of volunteer participants attends those who approach the information point. The final distribution of areas of intervention are agreed upon between the IAJ and Red Cross Youth in Andalusia. Youth groups provide initial information about the campaign and encourage young people to go through the information point. Volunteers take a quantitative registration of the number of people who have been treated during the intervention, both directly and indirectly. Description: During four months, we accompanied a group of young people of different origins in their first steps leading to employment. The aim of the project was to help young people legally residing in Luxembourg to become better integrated in the Luxembourgish labour market. 75% of young participants looked for a blue-collar job and 25% for a white-collar job. Most of the young participants came from either Sub-Saharan Africa, or Portugal. We offered them professional advice tailored to their personal needs, including how to develop their competences, how to present themselves to future employers, how to look for a job in an efficient way and how to build their first professional network. We also organised collective meetings that enabled young participants to share their experience (positive or negative) with other peers facing the same difficulties. The project culminated with speed meetings with entrepreneurs. These exchanges allowed participants to better understand their mutual needs. The project United for Employment was financially supported by Delhaize Group Fund within its programme for the promotion of social cohesion in local communities. Empowerment of the youth with regard to the labour market; Building a first professional network; Matching with entrepreneurs; and Exchanges with peers. During the project, 10% of young participants found a job. Body & Mind: Health Description: For 8 days, 46 young people and youth workers from Denmark, Italy, France, England and Sweden participated in a project about healthy lifestyles. The aim was to increase awareness about mental health/illness and highlight the importance of a healthy lifestyle. The participants were exposed to different kinds of training and workshops that challenged them both as individuals and as a group. They attended lectures about nutrition, entrepreneurship, and motivation etc., held by professionals. Other activities included presentations, training sessions, reflections, self-knowledge activities and discussions. The project was based on young peoples’ participation, which is why the variety of techniques should be wide enough to allow the full participation of everyone, regardless of their level of English, previous knowledge, fitness, abilities/ disabilities, etc. Some of the most relevant activities were: •	Ice-breaking games, such as climbing and a treasure hunt gave the young people the opportunity to work together solving different problems, exchanging experiences, knowledge and skills and working out alternative solutions in order to achieve results; •	They tried CrossFit, running, gymnastics, martial arts etc. and had lectures about mobility, nutrition and motivation. These forms of training allow everyone to participate on their own terms regardless of gender, age, disability, etc; and •	The chat groups were another important part of the programme. Divided into small groups with representatives from all countries, they discussed 4 subjects: stereotypes, social media, equality in sports and healthy living. This was one of the most popular activities in the evaluation. everyone involved in this project and the young people now have a network that extends far beyond their own countries. At local, regional and European level it is important to increase knowledge about a healthy active lifestyle, particularly in socio-economically disadvantaged areas, and this is what this project is all about. In Solna, this project had a large impact, as a lot of young people and staff were involved, as well as a lot of generous people who wanted to contribute to this project. Local politicians showed interested in the project and there was a presentation in the town hall for other administrations in the City of Solna. Youth Information tool: Youth exchange, interactive workshops, peer-to- peer and discussions groups. Enhancing the health competence of young Styrians and promoting a health balance, the biennial project “XUND und DU” (paraphrased as “HEALTH and YOU”) is based on the results of the European Health Literacy. Funded by the Austrian Ministry of Health and Women’s Affairs and the Styrian Provincial Government of Health, this project was implemented in cooperation with two Styrian associations: “LOGO Jugendmanagement”, who are specialised in youth information and “beteiligung.st”, specialised in youth participation. Achievements: All in all, more than 15,000 young people and 150 associations participated in the project “XUND und DU” in Styria. The project consisted of the following modules: Financial support for healthy activities “XUND und DU” gave youth organisations (e.g. youth centres, social workers, youth clubs…) the opportunity to realise their own micro projects, aimed at enhancing the health skills of young people. More than 200 different activities with over 12,000 young participants, which took place all over Styria, were supported by “XUND und DU” with a maximum of 300 euros. Youth events At seven big events – so called “Youth-Health-Conferences” –the supported activities were presented to more than 4,000 young people. These conferences showed a variety of opportunities for promoting physical and mental health. In addition, regional organisations offered various activities, dealing with areas such as “exercise – nutrition – mental health – prevention of diseases” and presented the range of regional health enhancing activities. Networking All over Styria a new network of specialist departments of health, youth workers and educational facilities has dealt with the topic of “health competence” and “adolescence”. Youth Peers 20 young people acted the role of journalists and spread the idea of “health competence” in their peer groups using their own channels (e.g. social media, photography…).